Happy afternoon to all my awesome lacquer lovers! A quick post today with Carpe Noctem Cosmetics Beyond the Clouds. Beyond the Clouds is a grey-green based holographic nail polish with a coppery sheen and multicolored flakes. I wish the coppery sheen was more prevalent in person though! The sun wasn’t really cooperating with me on the day I took these photos, but the holographic really shows up much better in person. This was a polish to mark the second anniversary of CNC’s shop being open and it is still available! Isn’t it a beauty? You should go peruse the Carpe Noctem Cosmetics shop at your leisure. Your thoughts on this polish? I love greys soo much! Next to blue, it’s probably my fav. No idea why, just think they’re all beautiful! I’ve really been enjoying them lately! I love those added flakes to the grey base! I think I don’t own enough grey holos btw. 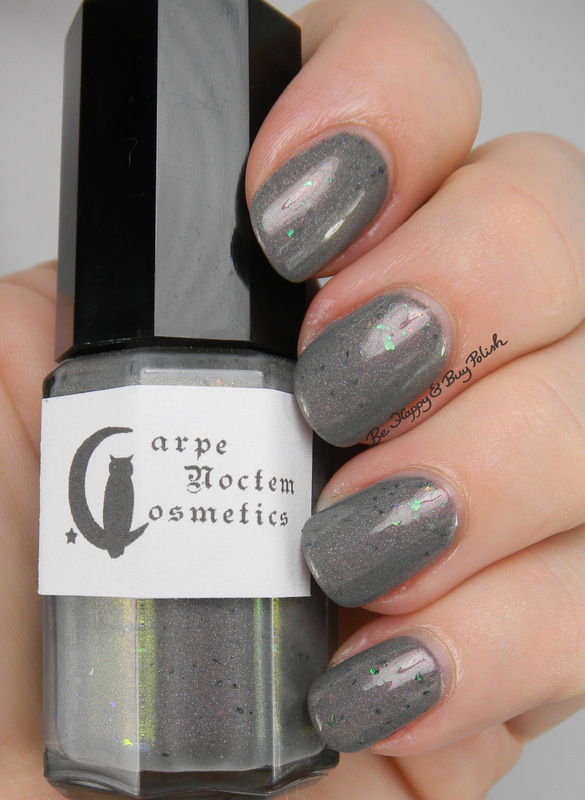 Grey holos are so gorgeous when done right like this one! Such a lovely grey and it looks extra awesome with those flakie bits in it. That is really lovely! I wasn’t a fan of the flakie trend initially, but I’ve been digging them when they’re in a colored base. I love it! I like when they’re in a colored base too! Such a beautiful shade! I still haven’t tried this brand!! What a beautiful tone! It’s def a very unique and pretty polish.